In order to ensure your chowder/bisque arrives fresh from our kitchen to your door, WE ONLY SHIP ON MONDAYS, TUESDAYS, AND WEDNESDAYS. Please keep in mind that a Monday holiday will delay shipments by one day for orders placed Thursday through Sunday. Other holidays may affect shipping dates - please call 1-800-688-9904 for more information. 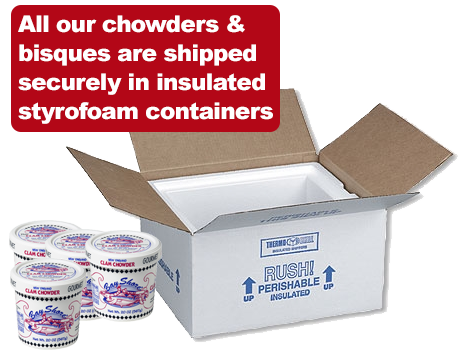 If you would like your chowders and bisques either delivered overnight or shipped on a particular day, please call us at 1-800-688-9904. We are more than happy to accommodate any shipping requests or any other special needs you may have!